Return to the dispute within stipulated resolutions of the United Nations, intensive of the talks with Greece and personal engagement of the Secretary-General of United Nations Ban Ki – moon, are the topics of discussion at yesterday's meeting of the Ban with the Prime Minister of Macedonia , Nikola Gruevski . Prime Minister said that Greece avoids efforts of the United Nations envoy , Ambassador Matthew Nimetz , dragging his initiatives refusing meetings and conversations . - The way things are set up now does not work because the other party successfully makes obstructions that are aimed at stalling and buying time . I think this has already been recognized and I think that the game will be changed, we will find another way to move things ,to become more active and to come to a solution . For us as a country is very important , because despite relations with our southern neighbor , it hampers our membership in NATO and the European Union , which for that part of Europe is an extremely important issue - Gruevski said after the meeting . During the meeting , Ban offered his personal commitment, to participate in an attempt to arrange a meeting at the highest level between the two countries, which Macedonia instantly accepted ,and now is expected how Greece would respond to it . 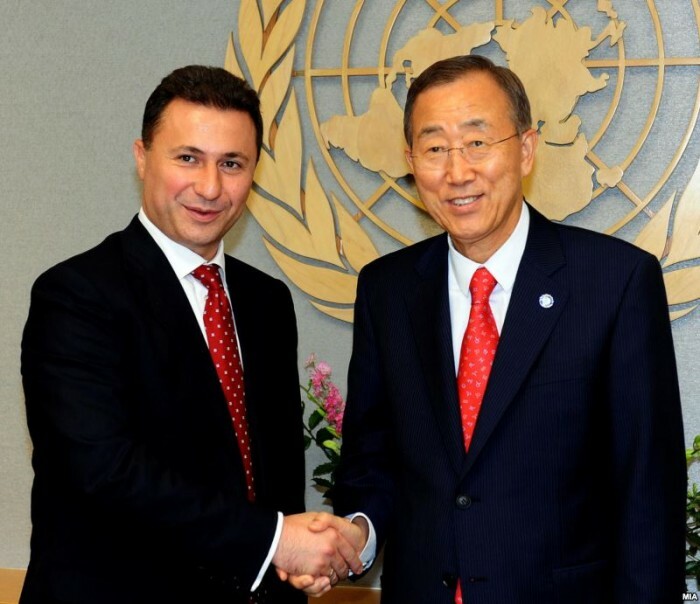 Another issues of the meeting Ban – Gruevski were Greek attempts to go beyond the limits set by the two resolutions of the Security Council of the United Nations dispute . Gruevski said that the Greek demands to discuss the name that will be used in all cases , and for renaming of the Macedonian language and nation are beyond the scope of these resolutions . In the next few weeks is expected meeting, that Nimetz announced in New York, and which will be attended by representatives of both sides , Zoran Jolevski and Adamantios Vassilakis , and specifying the initiative of Ban Ki - moon to intensify talks .